The University of Georgia has found that daily ginger consumption reduces muscle pain caused by exercise. While ginger had been shown to exert anti-inflammatory effects in rodents, its effect on experimentally-induced human muscle pain was largely unexplored, said Patrick O’Connor, a professor in the College of Education‘s department of kinesiology. 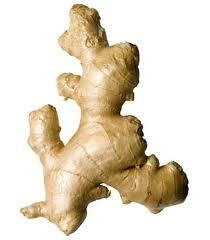 It was also believed that heating ginger, as occurs with cooking, might increase its pain-relieving effects. O’Connor directed two studies examining the effects of 11 days of raw and heat-treated ginger supplementation on muscle pain. Participants in the studies, 34 and 40 volunteers, respectively, consumed capsules containing two grams (about one teaspoon) of either raw or heat-treated ginger or a placebo for 8 consecutive days prior to exercising and 3 days afterward. On the eighth day they performed 18 extensions of the elbow flexors with a heavy weight to induce moderate muscle injury to the arm. For the three days prior to and after exercise, arm function, inflammation, pain and a biochemical involved in pain were assessed. The studies showed that daily ginger supplementation reduced the exercise-induced pain by 23-25%, and the effect was not enhanced by heat-treating the ginger. Collaborators included Chris Black, an assistant professor of kinesiology at Georgia College and State University in Milledgeville, UGA doctoral student Matt Herring and David Hurley, an associate professor of population health in UGA’s College of Veterinary Medicine. The study is published in the September issue of The Journal of Pain. It was funded by the McCormick Science Institute. Christopher D. Black, PhD, assistant professor, department of kinesiology, Georgia College and State University, Milledgeville, and leader of a study published in The Journal of Pain.